I’ve been using Green Guru Gear for a few years now and believe in their Made in Colorado (USA), upcycle/recycle philosophy. Before Davidson, the head honcho at Green Guru, contacted me about checking out their Tubular Insulated Can Sleeve and Sixer 6-pack Insulated Top Tube Holder, I had plenty of experience with the various pouches they make from upcycled bicycle inner tubes and have been happy with the performance having used a couple almost daily for a few years now. I’ve been using the Mid-size pouch to carry my phone, cash, etc. in my backpack while I use the Medium for the dongles for my computer gear. So, on to the Tubular Insulated Can Sleeve and Sixer 6-pack Insulated Top Tube Holder. Long-time fat-bike owner, Riverwest 24 teammate, intrepid traveler and backpack abuser, Tony Berger, spent the most time with the Tubular Insulated Can Sleeve and had this report on it. I was lucky enough to get the Riverwest24 Fatbike from Schlick Cycles to race in this years RIverwest24. It’s the bike that won the event in 2013 and Greg very graciously let me ride it again this year. When I picked it up it was sporting the Green Guru Insulated Can Sleeve and he asked me if I’d like to test it. FYI, the Can Sleeve is easy to attach with 3 Velcro straps plus it has a carrying sleeve for use off the bike as well. Sidebar – The Riverwest24 (http://riverwest24.com) is our big neighborhood event, and quite possibly the coolest urban ride/race in the country. 24 hours, 1000 riders and LOTS of beer make for some interesting times! On with Tony’s story – Sadly, the Tubular Insulated Can Sleeve was empty when I picked up the bike so I needed to head out right away to rectify the situation! The sleeve holds three beers in cans (I’ve heard it will work for other canned beverages but I wouldn’t know, your testing will be required) and fits perfectly along the top tube of most bikes. It was also so stable that I never even noticed it was there. I decided to test it at a couple of group rides and just out and about rides where it would be nice to ride a bit, stop for a beer, and continue on. The sleeve worked very well. It’s not a refrigerator or anything like that but for a few hours ride the beers were still plenty cool for consumption, thankfully, after a bit of riding. Here is a shot of Tony doing some real world testing during the 34th annual Fat Tire Tour of Milwaukee this year (http://fattiretour.com). It was hot and humid and the Can Sleeve performed well having been refilled several times over the course of the ride. On this day, at 90-degrees, I’d say you could go 1-1/2 hours before you’d want to crack that 3rd can open and still have some chill to your brew. More testing over more weather conditions will, of course, be required! It is much more comfortable to let the bike carry the load rather than your backpack. I love the what Green Guru does as a company by upcycling waste product that would otherwise be sitting in landfills. I have many of their products and have been using the Commuter 24L Roll Top Backpack for years and it’s alway my goto bag is inclement weather. In fact, I spent a month in Costa Rica and it was the only bag I took! I don’t need a lot of clothes in Costa Rica but I do need to bring along my various electronic leashes and digital oddities and I knew they would stay dry from past experiences with the backpack. It delivered, perfectly, even extremely over packed three weeks into the trip and during several heavy showers. I won’t hesitate to replace it with another one should it ever be needed…but they have a lifetime warranty. Green Guru! Upcycled, Affordable, and Made in America! Here are some more shots of the Can Sleeve taken during a trip in the San Juan Mountains of Colorado that Davidson and friends did showing some alternate mounting positions for the tube on their fatbikes. The Sixer 6-pack Insulated Top Tube Holder is designed as a Top Tube mounted 6-pack hauler and it works great for that purpose on road and city-style bikes with a level top tube. I’ve used it to good effect on my Schlick Growler. The loaded bag stays in place and the insulation works well for a trip from the shop to one of the many outdoor concerts I attend during the summer in Milwaukee. It is great rolling up to an event, meeting your friends and pulling out a cold beer from this bag rather than having to rummage through my back pack as I did for so many years! For bikes with sloping top tubes like my Schlick APe and Ralph MTB, complete with old-school banjo-style cable routing, it is harder to find a good way to mount it so here is a shot of the Sixer repurposed a bit for use on Surly Sunrise handlebars. It worked pretty well and with a bit of extra straps making for a slightly modified version, it would be a cool way to use the bag not only for beer cans on the bar but, as the beer disappeared, I put my camera in one slot, my gloves in another and even a lock. Very versatile! I handed out a couple of the zippered pouches to some of the competitors at the RW 24 and to some of the participants at the Fat Tire Tour of Milwaukee and expect them to chime in here at some point with words about their experiences with the pouches. If you are a Green Guru user, leave a comment below! 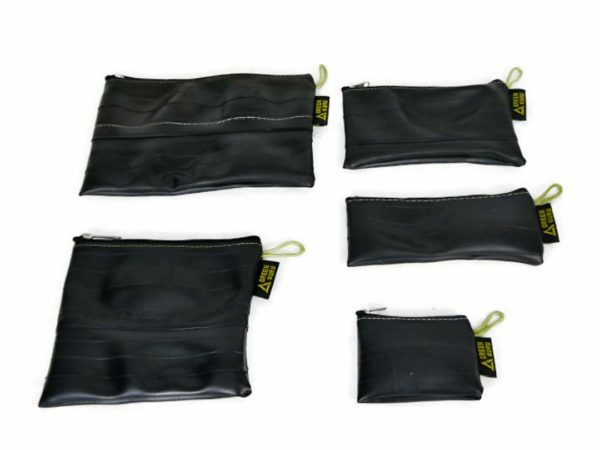 https://www.greengurugear.com/collections/accessories/products/zipper-pouches-package or check out the Green Guru Dealer page to find a shop that carries this super gear near you.